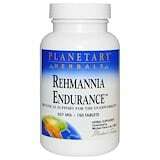 Planetary Herbals Rehmannia Endurance is based on the classic Chinese tonifier Rehmannia Six: Liu Wei Di Huang Wan, one of the most strengthening tonics of Chinese herbalism. Traditionally it was used for those who are tired and run down from overwork and inadequate rest due to a fast-paced lifestyle. Prepared Rehmannia Root, Poria Sclerotium, Tree Peony Root Bark, Chinese Yam Rhizome, Asian Water Plantain Rhizome, Fo-Ti Root, Chrysanthemum Flower, Ligustrum Fruit, Saw Palmetto Berry, Lycium Fruit Extract, and Asiatic Dogwood Fruit Extract.